So far, so good. I'm content with the progress of this painting. I won't be painting on it again until I have time to do it justice. If I know I won't be able to get back to a painting for a while, it is much better to leave it in a state that pleases me rather than in the middle of a problem that will annoy me every time I look at it. Below is a photo of it in the foundation stage. 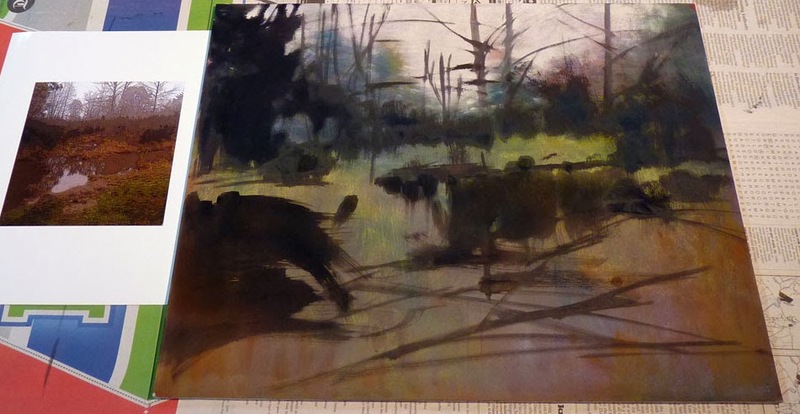 I washed off an old painting and applied a black acrylic foundation for value and composition. Pastel is applied on top of the acrylic. I posted this with additional text on February 15th. 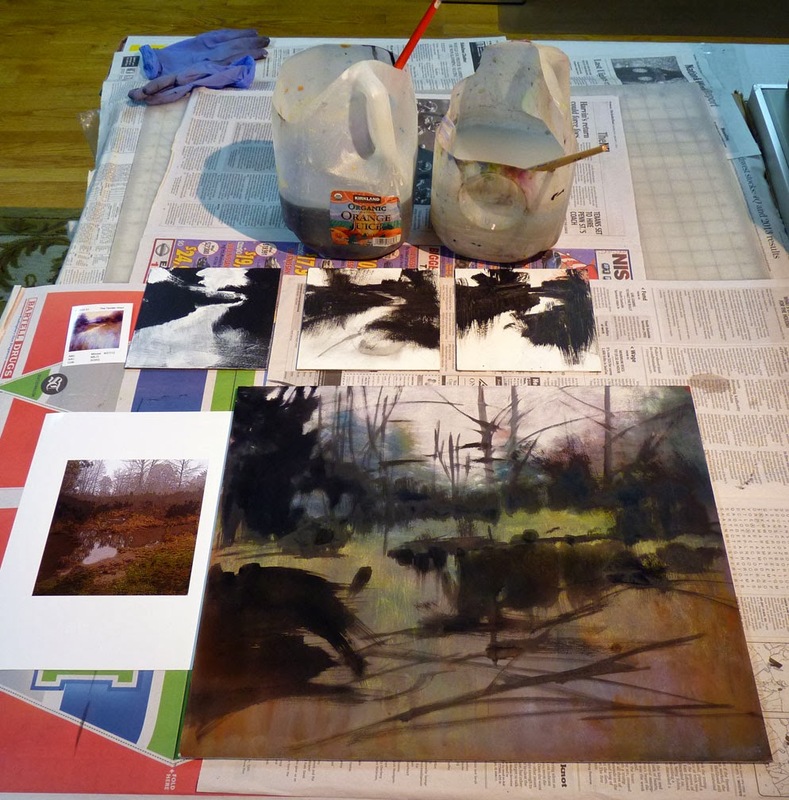 My small color studies are simplified versions of a larger painting. I don't include the detail work seen in the 18x18 inch finished painting. 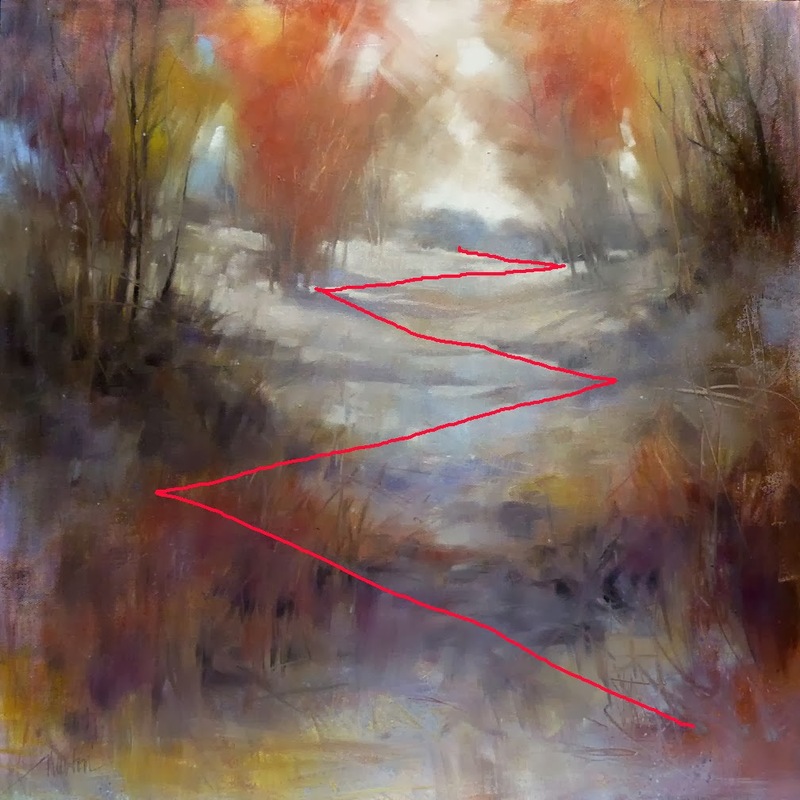 In this case, my color study also has a simplified path for the viewer. Seems like I have been painting "Destiny" forever! I'm calling it done. You can see a larger image of the finished painting here. 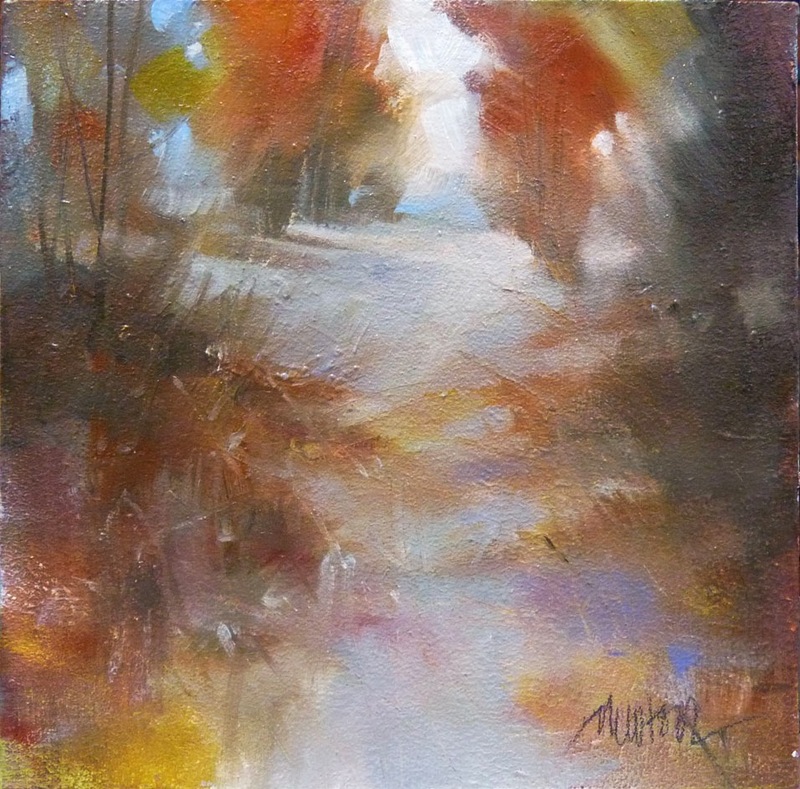 The second color study for "Destiny," this time 6x6 inches, oil, and different scene. I'm starting to wonder if a painting titled Destiny is meant to be painted forever. For purchase information and the magnifier, click here. The start of two projects in the studio tonight using black or white acrylic paint to suggest the scene for oil or pastel work. 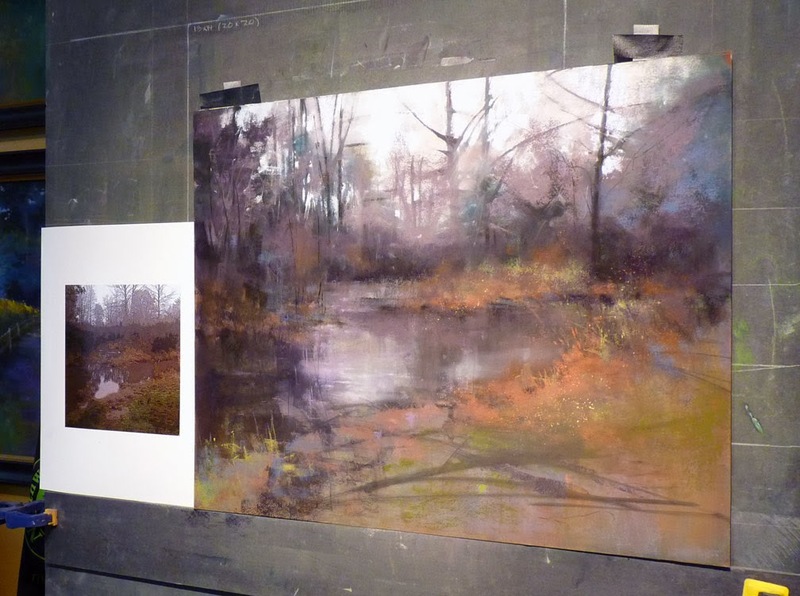 You can read more about this process in my book, Pastel Drawing on pages 138 & 139. At the top, two gallon jugs of water for washing out acrylic, one white, one black. In front of the jugs are three 6x6 panels with a little reference photo to their left. The photo is my painting, "The Tender Hour." 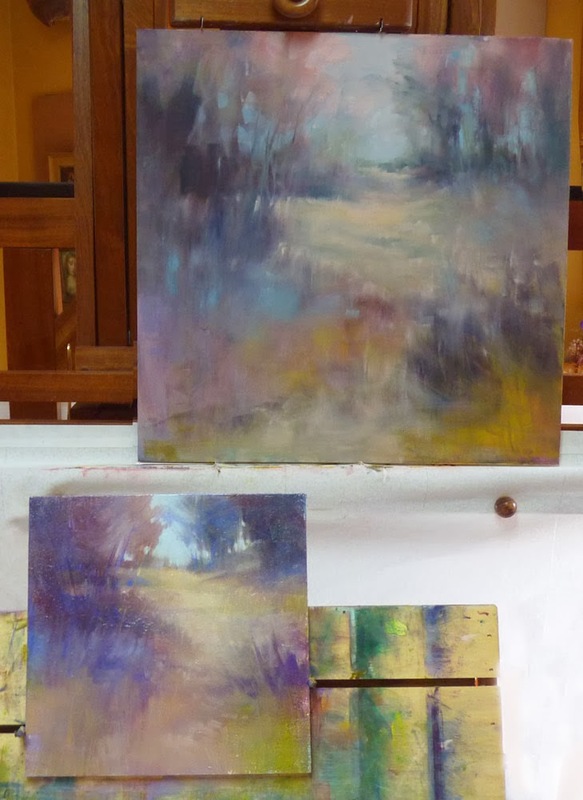 In the coming weeks, I'm going to give myself a refresher course on color and color temperature by painting in oil on the three little panels - basically the same scene on each. The panel at far left was black so I used white acrylic to suggest the scene, the other two are white so I used black acrylic. The acrylic "scene suggestion" layer will get covered with oil paint. Foremost in the photo is a pastel painting from a couple years ago that I washed off and to the left of it, is a reference photo of the scene I plan to paint. The pastel surface is Wallis mounted on archival foam core. I suggested the scene on the Wallis with black acrylic paint. I'll use pastel on top of that. Art imitates life? 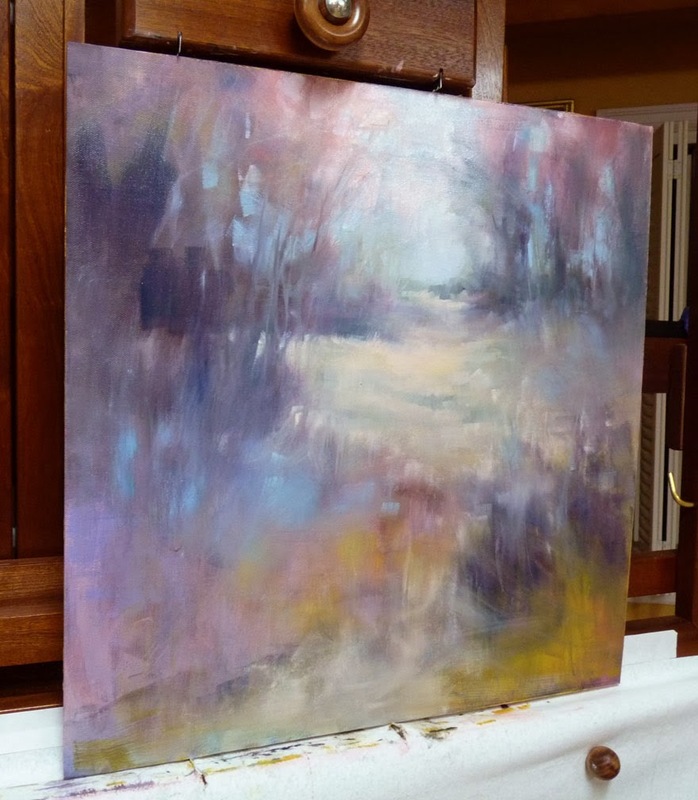 On January 23rd I posted a photos of "Destiny" on the easel along with my small color study. A week later, I began changing the colors. One more week, the post of February 5th, brought Destiny to where it is now. I like the top third a lot but I am lost on the rest so I'm painting another small color study, this time in oil, 6x6 inches. I will take my time solving problems with this little painting and try to remember that back and forth is just how life is sometimes. We made a quick trip trip to Portland, Oregon to rotate art and pick up substrates for larger oils. Stayed at a great Bed & Breakfast. More info and links. We're working on the recipe for a healthy, gluten-free muffin. Our first try was surprisingly good. Great news! 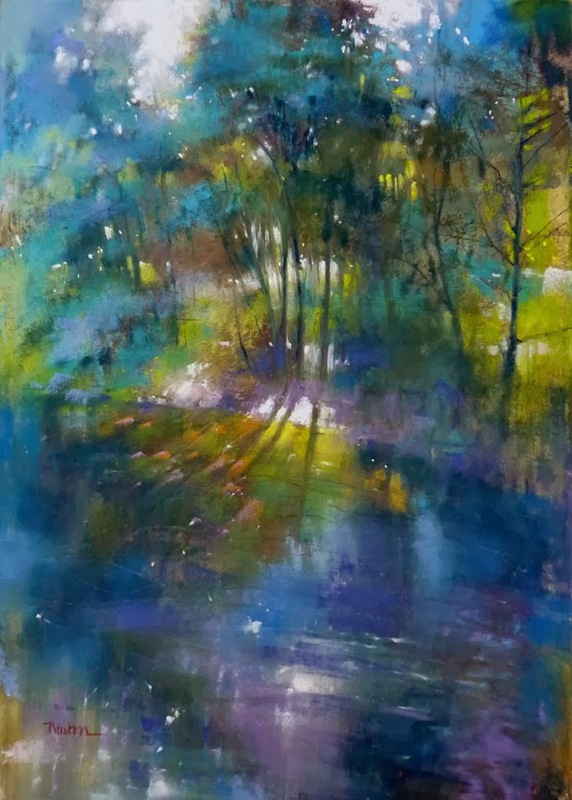 My pastel painting, Cedar River, will be part of the Umpqua College, Roseburg, Oregon permanent collection. 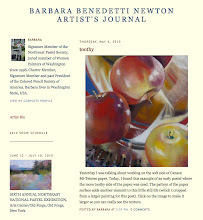 Thanks to Northwest Pastel Society for posting this Call for Artists last year. "Destiny," 18 x 18 inch oil is still on the easel. Busy with other things, I hope to get back to it soon.